Just as with the more common hip or knee replacement, elbow replacement, or total elbow arthroplasty, can offer substantial relief to someone suffering from joint pain in the elbow. All of these elements come together to produce your elbow joint, normally capable of bending and straightening at will with ease and zero friction or pain. When things go wrong, however, you may find yourself in a situation where having an elbow replacement is the best option. When an elbow replacement is performed, an artificial joint is inserted to replace the damaged portions of the humerus and ulna. It is made of metal stems with a plastic hinge. Orthopaedic Associates of St. Augustine have the most advanced team of joint specialists in the region. Our surgeons are highly trained in the area of partial and total joint replacement. We work with patients to view all available options before deciding on surgery. If surgery is deemed necessary, we offer the most noninvasive surgeries possible to allow for a swift recovery time. Osteoarthritis (OA): A chronic condition where the cartilage that cushions your joints breaks down, forcing the bones to rub against each other. This is one of the most common types of arthritis with about 27 million people suffering from it in the US alone and is usually found in people over 50. Rheumatoid arthritis (RA): An autoimmune disease in which the immune system accidentally attacks the tissue in your joints rather than foreign substances such as viruses. This affects 1.5 million people in the US and can lead to painful, red, swollen joints. Post-traumatic arthritis: Arthritis caused by a physical injury that leads to the decay of a joint. This could be caused by a car accident, fall, or any type of severe physical trauma that damages the cartilage and/or bone of a joint leading to the joint wearing out. 5.6 million Americans are affected by this and it presents itself in the form of joint swelling, pain, and fluid accumulation. Elbow fractures: If one or more of the bones found in the elbow joint are severely fractured, a doctor may have a difficult time putting them back together enough to give the patient normal mobility. Instead, they may elect to replace the joint to give the patient the least amount of pain and the most ease of movement. Instability: When the ligaments holding the elbow together are not high functioning and the elbow is susceptible to dislocation. This is often the result of an injury. If all non-surgical treatment options are not suitable to your situation and surgery is deemed the best option, Orthopaedic Associates will work with you to get you back to doing the things you love in no time. The surgery itself consists of making a small incision, generally on the back of the elbow. The doctor will remove the damaged parts of bone and tissue. Once everything is cleared out of the way, the metal/plastic joint will carefully be inserted and cemented in place. The incision will be closed and dressed and the procedure is finished. Rehab will be needed to ensure the success of the replacement. It normally takes about 6 weeks to be able to put any weight or strain on your arm. Some people are able to start using the arm more normally around 12 weeks after the procedure, though it can take up to a year for a full recovery. 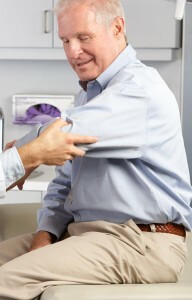 The chances that a joint replacement will lighten the pain and ease the movement of the elbow are quite high. If you’re experiencing elbow joint pain and would like to meet with one of our joint specialists, please feel free to request an appointment online. If you have more questions, call us at 904-825-0540.